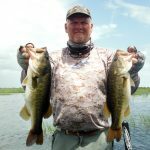 This week on Lake Okeechobee the winds have been from the NorthEast and NorthWest anywhere from 5 -20 mph and in the afternoons we have been having some small thunderstorms too. The water temp has dropped to 81 degres in the afternoons and this week the water level has rose about a foot but the water clarity is good all over the lake. The best bait in the morning is a Spinnerbait and a Chatterbait. You should fish pretty fast until you get a bite. With all the high water in the lake right now the fish are spread out a lot. In the mid-morning I have been flipping the Hydrilla mats with some success with a Gambler Mega Daddy in Blue Shadow with a 2oz. weight. Good areas to fish are Little Grassy, Kings Bar, Tin House and Harney Pond area. Here is a picture of a couple of fish I caught this week. You can check the water level of Lake Okeechobee at www.okeechobeejust4bass.com.